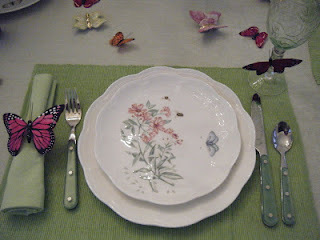 Flutterby: Restore...Renew Week 3, Day 3: What's For Dinner? Restore...Renew Week 3, Day 3: What's For Dinner? Tonight it is time to take out the treasures. You know, those precious things you have carefully packed away in a special cupboard or in a safe place. Those things you have been saving for that "special" occasion which never seems to be special enough to take them out. Yes, that porcelain dinner service you have received as a wedding gift, or that tea set you have inherited from your granny. It is time to take it out. We have something to celebrate tonight. Tonight is a very, very special occasion. What is it you may wonder? It is Life! We are celebrating being alive. What a better occasion than this to take out those carefully preserved treasures. Don't wait for a special day, today is that day!!! Even if you eat take-away hamburgers in those royal plates tonight. You are worthy to use them, your life is worthy of celebration. Shake out that finely embroidered tablecloth, polish the silverware and lay the table tonight with your finest dinnerware. I don't mean to imply that you should not look after these heirlooms, but use them and enjoy them. Celebrate every day for the simple beauty of it being NOW, and then wash them afterwards, put them carefully away and do it again.